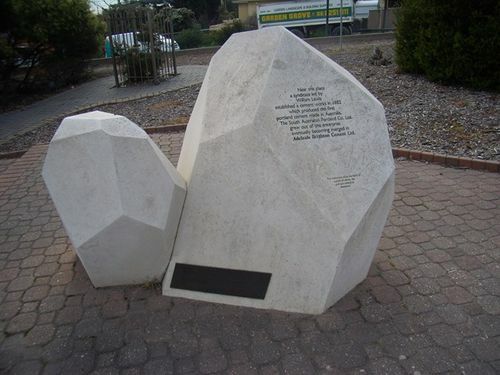 Monument commemorates the first Portland cement made in Australia. William Lewis, born in Wales in 1835, migrated to South Australia at the age of 21. As a lime-burner he tramped the nearby hills in search of raw materials which were abundant as the Brighton Series were part of precambrian limestone formations. He began cement-making experiments in 1882 and formed a syndicate to produce the first portland cement in Australia. Half a century earlier in England the invention of Portland cement had transformed the building industry and South Australia was importing about 8000 tons per annum in 1882. E. W. Schroder, A.O. Managing Director Adelaide Brighton Cement Ltd.